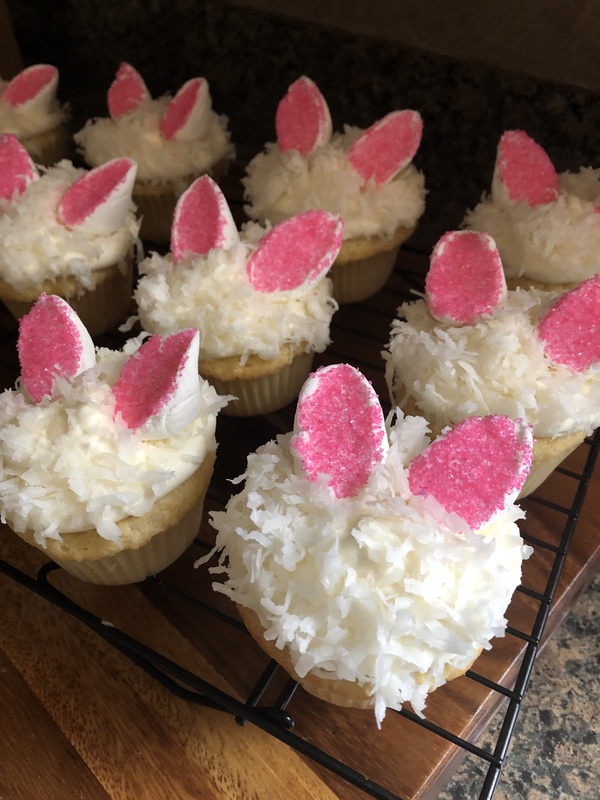 Earlier this week I showed you how quick and easy it is to create Sprouting Carrot Cupcakes and today I am showing you a fun companion cupcake to go with them, Bunny Ear Cupcakes. 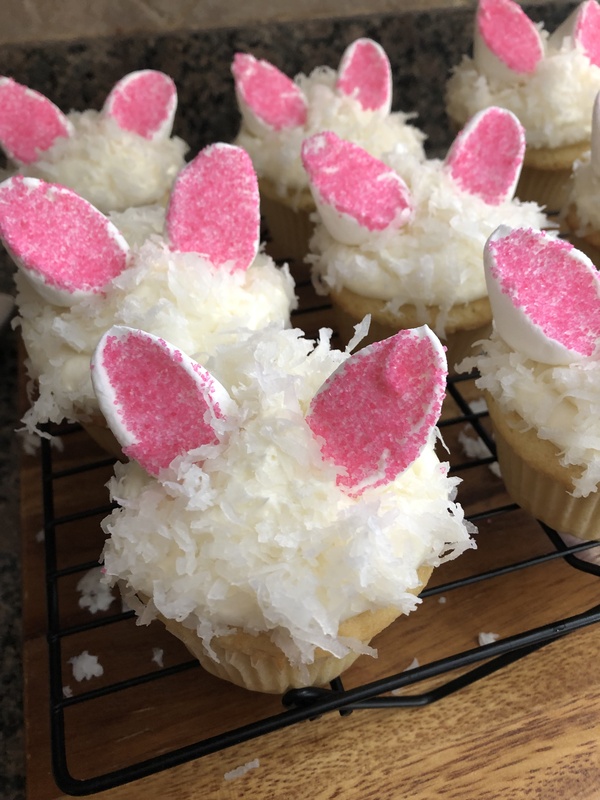 For these cupcakes I decided to make coconut cupcakes, since it is a popular flavor for Easter, topped with cream cheese frosting (my favorite frosting flavor). I then sprinkled the top of the frosting with sweetened shredded coconut. 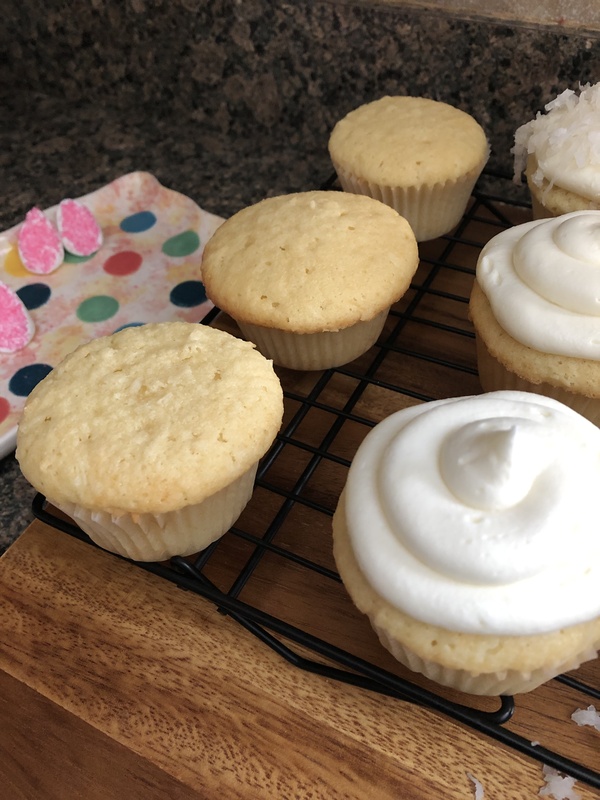 If you are not a fan of coconut, or, just want to make something a bit quicker and simpler you could opt to make a white or yellow box cake mix into cupcakes and then top it with store bought vanilla frosting and instead of topping the cupcakes with coconut opt for white sprinkles. 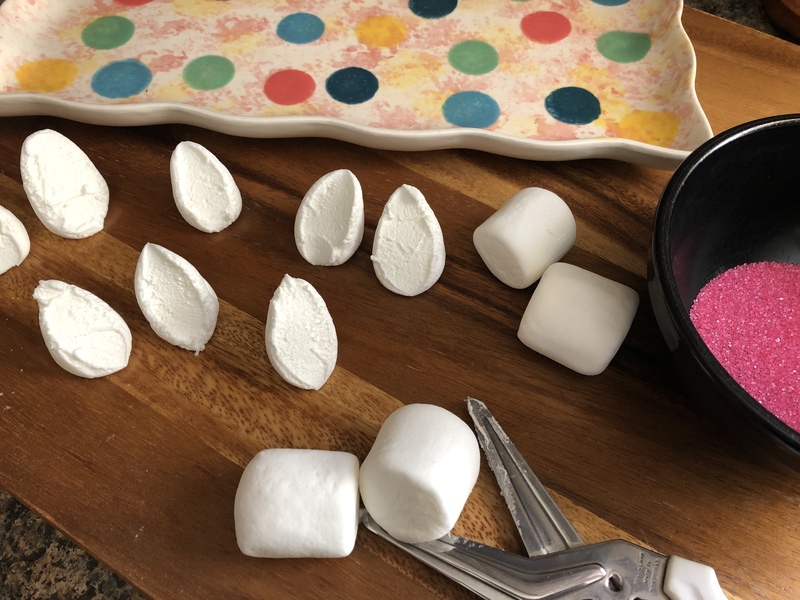 Using kitchen shears I cut large marshmallows in half on the diagonal. I then dipped the cut side in a small bowl I filled with pink sanding sugar. And voila, bunny ears. 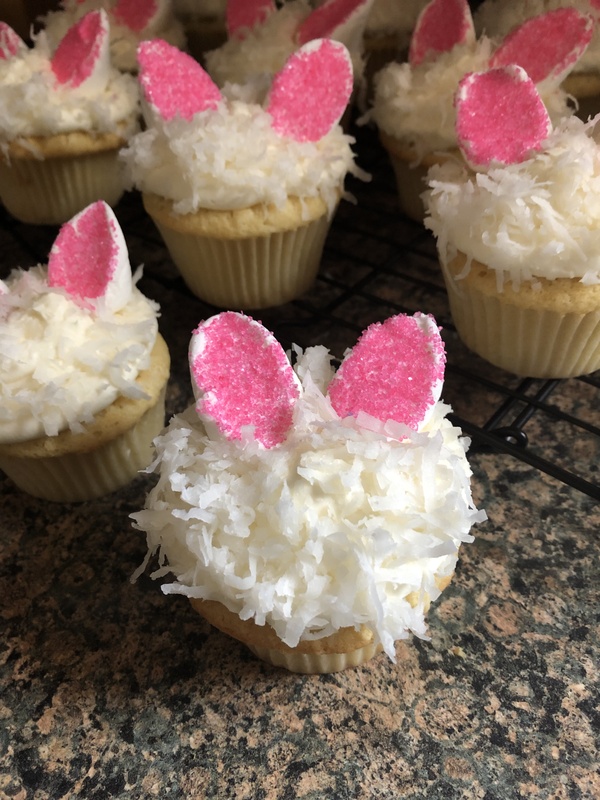 Next, I placed the marshmallow bunny ears on to the cupcakes. And there you have it, Bunny Ear Cupcakes. 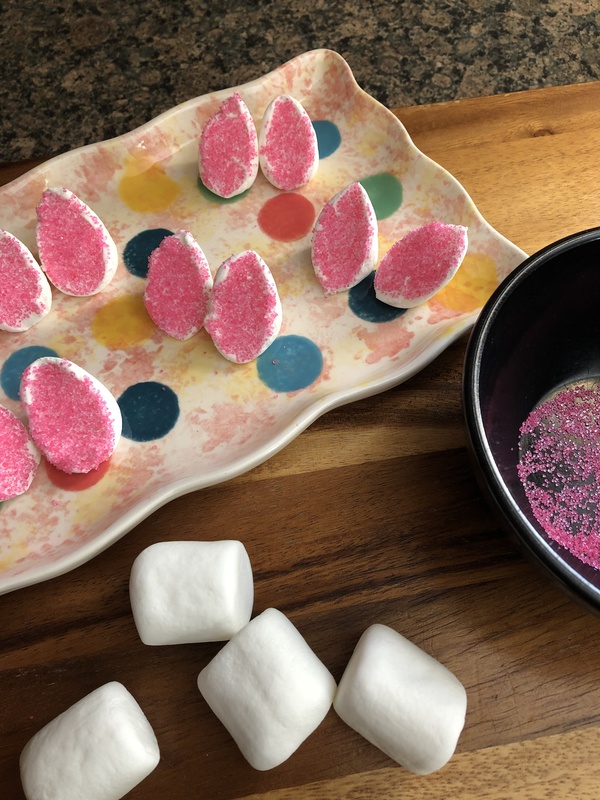 While I decided to stop with the ears, sometimes less is more, you could decorate these cupcakes further by using chocolate chips for the eyes and rolling a small ball of marshmallow in the pink sanding sugar for a nose. **I’ve gotten into the habit of making my own buttermilk. To do so, add 4 1/2 teaspoons of vinegar to a measuring cup, then fill it with enough milk (I’ve used 2% and whole milk) to reach 1 cup. Stir it a few times then let it sit for 10-15 minutes. The buttermilk is ready when it begins to curdle. For this recipe since I only needed 1/2 cup of buttermilk, I used 2 1/4 teaspoons of vinegar and added enough milk to my measuring cup to reach 1/2 cup. Preheat the oven to 325 F. Line a 12-cup cupcake tin with cupcake liners and set aside. Using a stand mixer or a handheld mixer beat the butter and sugar together on high spend until light and fluffy. Reduce the speed to low and add the eggs, 1 at a time. Scraping the bowl as needed between each addition. Add in the vanilla and almond extracts and continue mixing until everything is well incorporated. In a separate medium bowl sift together the flour, baking powder, baking soda and salt. Add the dry ingredients to the butter mixture in 3 additions, alternating with the buttermilk, beginning and ending with the dry ingredients. Mix until well combined and then fold in the shredded coconut. Divide the batter among the prepared cupcake tin, filling the batter to the top. Bake in the preheated oven for 25 – 30 minutes, or until a cake tester inserted in the middle comes out clean. Let the cupcakes cool in the pan for 15 minutes, and then transfer them to a wire rack to cool completely. Once completely cooled top with frosting. In a stand mixer or using a handheld mixer, beat the cream cheese and butter at medium speed until creamy. Gradually add in the sugar until well combined. Add in the vanilla extract and continue beating until the mixture is smooth and creamy. Oh my goodness,those are adorable!